Picture - A Republic F-105D-30-RE Thunderchief in flight with a full bomb load of sixteen 750 lb bombs on its five hardpoints. The Republic F-105 Thunderchief, was a supersonic fighter-bomber used by the United States Air Force. The Mach 2 capable F-105 bore the brunt of strike bombing over North Vietnam during the early years of the Vietnam War, and has the dubious distinction of being the only US aircraft to have ever been removed from combat due to high attrition rates. Originally designed and deployed as a single seat aircraft, a two-seat Wild Weasel version was later developed for use in the specialized Suppression of Enemy Air Defenses (SEAD) role against surface-to-air missile sites. It was commonly known as the Thud by its crews. As a follow-on to the Mach 1 capable F-100, the F-105 was also armed with missiles and a cannon; however, its design was tailored to high-speed low-altitude penetration carrying a single nuclear weapon internally. First flown in 1955, the Thunderchief entered service in 1958. As the largest single-engined fighter ever employed by the USAF, the single-seat F-105 would be adapted to deliver a greater bomb load than the four-engined, 10-man strategic bombers of World War II like the B-17 and B-24. The F-105 would be best remembered as the primary strike bomber over North Vietnam in the early stages of the Vietnam War. Over 20,000 Thunderchief sorties were flown, with 382 aircraft lost (nearly half of the 833 produced) including 62 operational losses. Although it lacked the agility of the smaller MiG fighters, USAF F-105s demonstrated the effectiveness of guns, and were credited with downing 27.5 enemy aircraft. During the war, the two-seat F-105F and F-105G Wild Weasel variants became the first dedicated Suppression of Enemy Air Defenses (SEAD) platforms, fighting against the Soviet-built S-75 Dvina (NATO reporting name: SA-2 Guideline) surface-to-air missiles. Two Wild Weasel pilots were awarded the Medal of Honor for attacking North Vietnamese surface-to-air missile sites, with one shooting down two MiG-17s the same day. The dangerous missions often required them to be the "first in, last out", suppressing enemy air defenses and keeping them suppressed while strike aircraft accomplished their missions and then left the area. Although the F-105 weighed 50,000 pounds (23,000kg), the aircraft could exceed the speed of sound at sea level and Mach 2 at high altitude. It could carry up to 14,000lb (6,400 kg) of bombs and missiles. The Thunderchief was later replaced as a strike aircraft over North Vietnam by both the McDonnell Douglas F-4 Phantom II and the swing-wing General Dynamics F-111 Aardvark. However, the "Wild Weasel" variants of the F-105 remained in service until 1984, when they were replaced by a specialized F-4G "Wild Weasel V". Republic Aviation started the Thunderchief as an internal project to replace the RF-84F Thunderflash, which first used the characteristic wing-root air intakes to place cameras in a pointed nose. The design team led by Alexander Kartveli examined some 108 configurations before settling on a large, single-engine AP-63FBX (Advanced Project 63 Fighter Bomber, Experimental) - AP-63-31 actual. The new aircraft was intended primarily for supersonic, low altitude penetration into the Soviet Union on a hi-lo-hi mission and delivery of a single, internally carried nuclear bomb. Thus, with emphasis placed on low-altitude speed and flight characteristics, range and payload, the aircraft would be fitted with a large engine, and a relatively small wing with a high wing loading which would give a stable ride at low altitudes, and less drag at supersonic speeds. 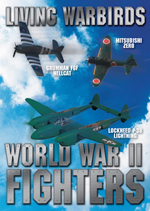 Traditional fighter attributes such as maneuverability were a secondary consideration. Enthusiastic at first, the United States Air Force awarded Republic with a contract for 199 aircraft in September 1952. However, by March 1953 the USAF had reduced the order to 37 fighter-bombers and nine tactical reconnaissance aircraft, citing the approaching end of the Korean War. By the time the F-105 mock-up had been completed in October 1953, the aircraft had grown so large that the Allison J71 turbojet intended for it was abandoned in favor of an even more powerful Pratt & Whitney J75. Anticipating protracted development of the engine, it was expected that the first aircraft would use the smaller Pratt & Whitney J57. On 28 June 1954, the USAF officially ordered 15 F-105As under the Weapon System designation WS-306A. The YF-105A prototype first flew on 22 October 1955, with the second YF-105A following on 28 January 1956. In spite of being powered by a less potent J57-P-25 engine with 15,000 pounds-force (67kN) of afterburning thrust (the J75 was expected to generate 24,500lbf (109 kN) with the afterburner), the first prototype attained the speed of Mach 1.2 on its maiden flight. Both prototypes featured conventional wing root air intakes and slab-sided fuselages typical of the early jets. However, insufficient power and aerodynamic problems with transonic drag, as well as Convair's experience with their F-102, led to a redesign of the fuselage in order to conform to the Area rule, giving it a characteristic "wasp waist". In combination with the distinctive forward-swept variable-geometry air intakes which regulated airflow to the engine at supersonic speeds and the J75 engine, this enabled the resulting F-105B to attain Mach 2.15. In March 1956, the USAF replaced its F-105A order with that for 65 F-105B. This model added the MA-8 fire control system with an AN/APG-31 ranging radar, and K-19 gunsight which allowed toss bombing. The first pre-production YF-105B flew on 26 May 1956, and on 19 June, the aircraft was officially named Thunderchief, continuing the Republic Aviation's nomenclature sequence of P-47 Thunderbolt, F-84 Thunderjet, and F-84F Thunderstreak/RF-84F Thunderflash. The first production F-105B flew on 14 May 1957. The F-105 was a mid-wing monoplane with a 45� swept wing and tail surfaces. The single engine was fed by two intakes in the wing roots, leaving the nose free for a radome housing the multi-mode radar. At the time, the F-105 was the largest single-seat combat aircraft ever built. Its capacious fuselage provided room for 1,160 US gallons (4,390L) of fuel and a bomb bay measuring 15feet 10inches (4.83m) by 32in (0.81 m) by 32in (0.81 m), originally intended for a single nuclear weapon but typically containing an additional 390USgal (1,500 L) fuel tank. Two under-wing and one centerline wet-stores-capable pylons were provided for 450 and 650 USgal (1,700 and 2,500 L) drop tanks. Two outboard (dry) stations were wired for missiles or bombs. A single T-171E3 (later redesignated as the M61 Vulcan) 20 mm 6-barreled Gatling cannon was installed in the left side of the nose with a magazine for 1,028 rounds of ammunition, combined with a radar ranging gunsight in B and D models. The aircraft was designed to carry the short-range Sidewinder but it would not be equipped with the medium-range radar-guided missiles. On 11 December 1959, an F-105B piloted by Brig Gen Joseph Moore (commander of the 4th Tactical Fighter Wing) set a world record of 1,216.48 miles per hour (1,958km/h) over a 62 miles (100km) circuit. Moore received the Bendix Trophy in 1959 for this feat. 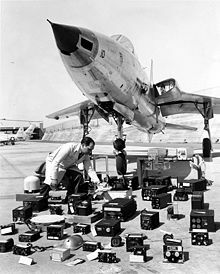 Plans to build over 1,500 F-105Ds were cut short when the Secretary of Defense Robert McNamara decided to equip no more than seven combat wings with the type. Production was cut in favor of the Air Force adopting the Navy's F-4 Phantom II. A total of 833 F-105s were produced before production ended in 1964. Picture - Two U.S. Air Force Republic F-105 Thunderchiefs, an F-105F-1-RE trainer and an F-105D-31-RE, with Mount Fuji, in the background. The F-105 was designed primarily for low-level interdiction and its low-altitude speed was its greatest asset when dealing with Soviet/Communist Chinese-made MiG-17/J-5s and MiG-21 fighters. The Thunderchief's highly loaded wing was excellent for speed and aerodynamic stability but not for sustained turns in a dogfight. Nevertheless, the F-105 managed 27.5 officially credited air-to-air victories against North Vietnamese aircraft at the cost of 17 aircraft lost to enemy fighters (North Vietnamese pilots claimed to have shot down an additional 23 F-105s but none have been confirmed by USAF). All victories were against MiG-17s. A total of 24.5 were shot down with cannon fire (one victory was shared with an F-4), and three with AIM-9 Sidewinder missiles. F-4 Phantoms were tasked with escorting the Thuds from enemy fighters, but they lacked the internal gun and ranging gunsight of the Thunderchief until late in the war, and had a profile that sometimes caused confusion with the delta-winged MiG-21 by F-105 crews. Picture - The cockpit of a F-105D Thunderchief. On the basis of combat experience, the F-105D was updated with a better ejection seat, radar homing and warning (RHAW) antenna on the tail fin, additional armor, and protection to the hydraulic system which proved to be very vulnerable to combat damage. The hot and humid climate of Southeast Asia created problems for the capricious electronics, a problem encountered by virtually all advanced U.S. aircraft of the war. High ambient temperatures also exacerbated the F-105's propensity for engine fires due to inadequate cooling of the afterburner. Most of the aircraft deployed to Vietnam were eventually fitted with ram-air scoops to ameliorate this problem. The rear cockpits of several two-seat F-105Fs were modified under project Commando Nail with an R-14A radar and a radar scope that offered high resolution. These aircraft were used for all-weather and night low-level strikes against especially dangerous targets by a unit from the 13th Tactical Fighter Squadron (1966-1975) dubbed "Ryan's Raiders" starting in April 1967. Commando Nail aircraft were also used to develop tactics for proposed Convair B-58 Hustler bomber missions in Vietnam, although the Hustler was never deployed to Southeast Asia. Some of these aircraft were later converted to the Wild Weasel III standard. In an effort to thwart MiG attacks, several F-105Fs were also fitted with Hallicrafters QRC-128 VHF jammers under project Combat Martin. The North Vietnamese interceptor force followed Soviet air-defense doctrine, with pilots under rigid direction of ground controllers over radio links. The QRC-128, nicknamed "Colonel Computer", filled up the rear cockpit of the F-105F and bounced voice communications over the radio channel back out after a delay, resulting in an obnoxious garble. However, the first time the Combat Martin was used, the US National Security Agency (NSA), in charge of US strategic signals intelligence, ordered the Air Force to cease and desist immediately, since the NSA believed that the intelligence obtained by monitoring the channels outweighed the benefits of jamming them. Some of these aircraft were eventually brought to the Wild Weasel III standard. Persistent problems with the AN/ARN-85 LORAN system resulted in 30 F-105Ds being upgraded to the AN/ARN-92 in a long dorsal spine. Known as Thunderstick II aircraft, these F-105s could achieve a bombing circular error of probability (CEP) of 50 feet (15m) from an altitude of 15,000ft (4,600 m). Although the first of these aircraft flew in 1969, they were never deployed to Vietnam. In 1965, the USAF began operating two-seat F-100F Super Sabres specially equipped for Suppression of Enemy Air Defenses mission in Vietnam. Nicknamed the Wild Weasel, these aircraft achieved nine confirmed victories against North Vietnamese surface-to-air missile radars. The second crew member was a Navigator trained as an Electronic Warfare Officer (EWO), nicknamed the Bear (as in trained bear), whose job was to decipher the information from the aircraft's sensors and guide the pilot towards the targets. However, the F-100F was an interim solution and because of its limited payload it usually had to rely on accompanying strike aircraft to actually attack the SAM sites. It also lacked the speed and the endurance to effectively protect the USAF's primary strike fighter, which was the F-105 at that time. With twice the payload capacity of the Super Sabre and considerably better performance, the two-seat F-105F was an ideal candidate for a more definitive SEAD platform. Picture - Republic F-105F with armament layout in August 1964. Armament includes 20mm (.79in) cannon rounds, 2.75in (70mm) rockets, Bullpup and Sidewinder missiles, general purpose bomb, cluster bombs, LAU-3A Launchers, flare and chaff dispensers and drop tanks. The resulting EF-105F Wild Weasel III (the EF designation was popularly used but unofficial) supplemented its sensors and electronic jamming equipment with AGM-45 Shrike anti-radiation missiles and conventional bombs, giving it an offensive capability lacking in the F-100F. The first of these aircraft flew on 15 January 1966 and they began arriving in Southeast Asia in June, with five assigned to the 13th TFS at Korat RTAFB and six more to the 354th TFS at Takhli RTAFB. In a typical early mission, a single EF-105F would accompany one or two flights of F-105Ds to provide protection from enemy ground fire. While this strategy was effective in reducing F-105D losses, the Weasel aircraft suffered heavy casualties with five of the first 11 lost in July and August 1966. Attacks into high-risk environments saw the Weasels operating in "Iron Hand" Hunter-Killer flights of mixed single-seat and two-seat Thunderchiefs, suppressing sites during attacks by the strike force and attacking others during ingress and egress. The EF-105Fs were upgraded to the definitive Wild Weasel Thunderchief, the F-105G, with the first aircraft arriving in Southeast Asia in late 1967. The genesis of the F-105G was a PACAF policy that all USAF fighter-bombers operating over North Vietnam had to carry ECM pods, which served to degrade the Weasel's own electronics and occupied one ordnance wing hardpoint. The F-105G incorporated a considerable amount of new SEAD-specific avionics, including an upgraded RHAW system which required a redesign of the wingtips. To free outboard hardpoints for additional weapons, the Westinghouse AN/ALQ-105 electronic countermeasures were permanently installed in two long blisters on the underside of the fuselage. Thirty aircraft were fitted with specially designed pylons to permit carrying of the AGM-78 Standard anti-radiation missile, a considerable improvement over the somewhat lackluster Shrike. On a typical mission, the F-105G carried two Shrikes on outboard pylons, a single Standard on an inboard pylon balanced by a 450USgal (1,700 L) fuel tank on the other side, and a 650USgal (2,500 L) centerline fuel tank. The Wild Weasel aircraft were usually the first to arrive in the target area and the last to leave, staying after the strike to support rescue of downed aircrews. 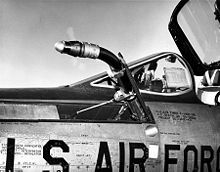 As such, fuel was a precious commodity and it was not uncommon for a Wild Weasel to require a 30-minute leave for aerial refueling in order to continue its mission. Although the F-105D was withdrawn from Vietnam in 1970, the Wild Weasel aircraft soldiered on until the end of the war. They were gradually replaced by the F-4G Wild Weasel IV variant of the F-4 Phantom II. F-105B/D/F/Gs served with Air Force Reserve and Air National Guard units until the mid-1980s. The last Air National Guard unit was the 116th Tactical Fighter Group of the Georgia Air National Guard at Dobbins AFB, Georgia, flying the F-105G through 1983. The last Air Force Reserve unit, and the last USAF operator of the Thunderchief, was the 419th Tactical Fighter Wing at Hill AFB, Utah, which flew the F-105B/D/F through 1984. 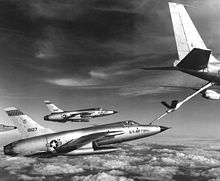 Picture - F-105 Thunderchief refueling from KC-135 tanker. 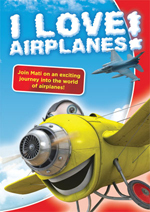 The initial reaction of the fighter pilot community to their new aircraft was lukewarm. Between its massive dimensions and troubled early service life, the F-105 had garnered a number of uncomplimentary nicknames. In addition to the aforementioned "Thud", nicknames included the "Squat Bomber", "Lead Sled", and the "Hyper Hog" and/or "Ultra Hog". The aircraft's offensive capabilities were sarcastically referred to as a "Triple Threat"--It could bomb you, strafe you, or fall on you. With time, however, the F-105's responsive controls, excellent performance at high speed and low altitude, and sophisticated electronics won over even some of the F-104 Starfighter pilots. The "Thud" changed to a term of respect and endearment to the point where the RF-84F Thunderflash became known as the "Thud's Mother". Former F-86 Sabre pilot Jerry Noel Hoblit recalled the awe of the F-105's size after seeing it in person for the first time; he could not manage to reach the air intake lip even with a running jump. The F-105 had a spacious cockpit with a good layout (particularly after introduction of "tape" instruments) and visibility (except to the rear), and the advanced electronics were easy to learn and operate. With high wing loading, the Thunderchief was by all accounts an excellent aircraft to fly at high speeds. Takeoffs and landings were often performed in the 230mph (370 km/h) range. The spoilers provided good roll control at all speeds and the distinctive four-petal airbrakes (which also opened slightly when the afterburner was engaged to allow for the larger flow of exhaust gases) were highly effective even at supersonic speeds. Loss of control due to a spin or complications of adverse yaw required deliberate effort from the pilot and spontaneous spin recovery was rapid. The costs are in approximately 1960 United States dollars and have not been adjusted for inflation. The F-105B entered USAF service with the Tactical Air Command's 335th Tactical Fighter Squadron on 27 May 1958. Typical of advanced aircraft, early F-105 service life was plagued by problems with avionics and the MA-8 fire-control system, with the aircraft requiring some 150 hours of maintenance for each hour of flying time. Most of the problems were addressed under Project Optimize. The lack of spares resulted in the entire F-105B fleet being briefly grounded in 1960. Nevertheless, the Thunderchief became the first aircraft in USAF history to complete its first operational year without a single major accident. In 1964, specially modified F-105Bs with ballast replacing the Vulcan cannon, a number of fuselage and wing reinforcements for aerobatics, and the addition of a smoke generator, briefly flew with the United States Air Force Thunderbirds demonstration team. After only six shows, a fatal accident from overstressing the airframe forced a switch back to the F-100 Super Sabre. Picture - Republic F-105D-6-RE refueling probe detail. The -D model had two types of in-flight refueling equipment: a probe (for the drogue) and a receptacle (for the boom). By 1964, the F-105B was relegated to Air National Guard squadrons. It was replaced in frontline service by the definitive F-105D whose advanced NASARR R-14A radar and AN/ASG-19 Thunderstick fire-control system gave it all-weather performance. The R-14A radar also added a terrain-following radar capability. The F-105D entered service with 335th TFS in 1960. Designed for a European conflict with the Soviet Union, the F-105D saw considerable deployment in West Germany to provide NATO with tactical nuclear strike capability, and in Japan. Like the F-105B, the F-105D's early career was plagued with maintenance problems and in-flight failures. The origins of the nickname Thud were obscure, some claim that it stood for the sound of an F-105 crashing into the ground. Another theory is that the name was in reference to the detonation of bombs during a "mud-moving" sortie. The entire F-105D fleet was grounded in December 1961 and then again in June 1962. Many of the issues were worked out during the production run and by 1964, early F-105Ds were upgraded with these fixes under project Look Alike, although engine failures and fuel system problems persisted until 1967. Meanwhile, the USAF was gradually changing the anticipated F-105 mission from nuclear interdiction to conventional bombing. The Look Alike upgrades increased the aircraft's capacity from four to 16 conventional 750lb (340 kg) bombs on underwing and fuselage centerline hardpoints and added the equipment to launch AGM-12 Bullpup air-to-ground missiles. In June 1961, an F-105D delivered 15,430lb (7,000 kg) of conventional bombs during a USAF test-at the time a record for a single-engine airplane and a payload three times heavier than World War II's four-engined heavy bombers such as the Boeing B-17 Flying Fortress and the Consolidated B-24 Liberator, though aerial refueling would be required for long missions. One of the F-105Ds was named Memphis Belle II after the famed World War II B-17. In spite of a troubled early service life, the F-105 became the dominant attack aircraft early in the Vietnam War. The F-105 could carry more than twice the bomb load farther and faster than the F-100, which was used mostly in South Vietnam. In a foreshadowing of its Wild Weasel role, the first F-105D combat mission of the war involved an attack on 14 August 1964 against an anti-aircraft artillery site on Plaine des Jarres. This mission was carried out by aircraft of the 36th TFS, 6441st Tactical Fighter Wing deployed from Yokota Air Base Japan to Korat Royal Thai Air Force Base. The first Thunderchief lost in the war also occurred during this mission (the pilot managed to eject safely). The first strike mission took place on 13 January 1965 with the destruction of the Ben Ken bridge in Laos. Following the start of Operation Rolling Thunder on 1 March 1965, a large number of F-105Ds were deployed in Royal Thai Air Force Bases at Khorat and Takhli. 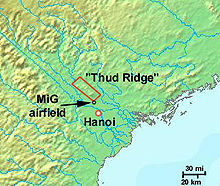 Picture - Location of the Thud Ridge and the MiG airfield on its southern tip. On 3 April 1965, the first strike package to be sent against the Thanh Hoa Bridge comprised 79 aircraft, including 45 F-105 Thunderchiefs as the main strike force. The Bullpup missiles were early "smart" precision guided missiles that were guided by radio and joystick, but the their small warheads did not inflict any damage. The next day, they would encounter MiGs for the first time as they struck the bridge again. 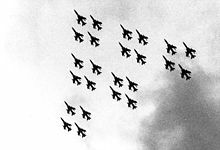 The opposing force of eight MiG-17s faced 46 F-105s that were escorted by a MiGCAP flight of 21 F-100 Super Sabres. Coming undetected from clouds above, the MiG-17s tore past the escorts and dove onto the bomb-laden Thunderchiefs. Two Thuds were lost to the MiG-17 attack. A third that was thought to be lost to groundfire was later claimed by the communist side as shot down by a MiG-17. An F-100 claimed the only probable MiG-17 kill, although the Vietnamese pilot believes three of his comrades were shot down by F-105s. A fourth plane piloted by John Boyd narrowly escaped. 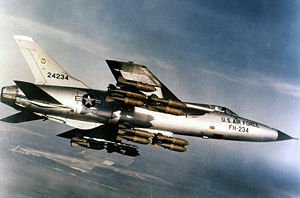 U.S. Air Force chief of staff General John P. McConnell was "hopping mad" to hear that two of America's most advanced F-105 Thunderchiefs had been shot down by elderly subsonic MIGs (which had first seen service at the end of the Korea War) of the tiny North Vietnamese air force. On 2 August 1967, F-105Ds from 335th and 338th Tactical Fighter Squadrons made the first of many successful raids on the Paul Doumer bridge. While the planes were first deployed with their original natural metal finish, they soon adopted the distinctive two-green and tan Vietnam camouflage scheme which blended into the jungle landscape. On a typical combat mission into North Vietnam, the F-105D carried two 450USgal (1,700 L) wing-mounted fuel tanks, a 390USgal (1,500 L) fuel tank in the bomb bay, and five 1,000lb (450 kg) or six 750lb (340 kg) bombs, and required inflight refueling going to and sometimes returning from Hanoi 700mi (1,100 km) distant. Thunderchiefs made a loop north of Hanoi over a mountain nicknamed the Thud Ridge 21�16′47″N 105�49′37″E﻿ / ﻿21.27972�N 105.82694�E﻿ / 21.27972; 105.82694 at high speed and low altitude in order to avoid the heavily defended airspace around the city. Although the ridge provided proper shielding from the North Vietnamese radars and SAMs, the installment of anti-aircraft artillery and a MiG fighter airfield at the southern end of the valley prevented the F-105s from fully exploiting the benefit of cover. The name "Thud Ridge" (also the name of a book by Jack Broughton about the F-105) came from the prominent role of the mountain in F-105 missions. Unfortunately, the low-altitude attacks and dive bombings forced the F-105s to fly right through the frequently heavy North Vietnamese anti-aircraft fire. Designed originally to be a nuclear bomber and not for hitting precision targets, the F-105 had only a dive bombing sight for the pilot to hit its target, and lacked any kind of a bomb guidance system that would allow for bombing from a stand-off distance, and so it could only hit its targets by dive bombing through the local anti-aircraft fire. This period of time was also before the "smart" laser and TV-guided bombs were developed. The attrition rates were so high that the USAF began experiencing shortages of combat-ready aircraft. A total of 382 F-105s were lost in Southeast Asia, 320 of those in combat-most to enemy ground fire. Of the 610 single-seat F-105Ds built, 283 were shot down and 52 lost operationally. Of the 143 F-105F/G two-seaters, 37 were shot down and 10 lost operationally (one "Ryan's Raiders" night interdiction aircraft and one Combat Martin jammer without a back-seat WSO were lost in combat, the other 45 losses were Wild Weasel aircraft). As production of F-105s had ended, the type was thus replaced in the Vietnam War by other aircraft, primarily the McDonnell Douglas F-4 Phantom II and the new LTV A-7 Corsair II, which despite being a cheaper subsonic aircraft, had the computerized stand-off bombing and guidance systems that the F-105 lacked. By November 1970, the last of the F-105Ds had been withdrawn from combat in Vietnam. USAF Captain Merlyn H. Dethlefsen was awarded the Medal of Honor and Capt Kevin "Mike" Gilroy the Air Force Cross for an F-105F Wild Weasel mission on 10 March 1967, flying F-105F, AF Ser. No. 63-8352. 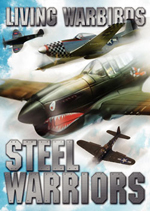 After their aircraft was damaged by ground fire, Dethlefsen and Gilroy elected to stay in the skies above the steel works at Thai Nguyen until the SAM site was found and destroyed. USAF Captain Leo K. Thorsness was awarded the Medal of Honor and Capt Harold Johnson the Air Force Cross for an F-105F Wild Weasel mission on 19 April 1967, flying F-105F, AF Ser. No. 63-8301. Thorsness and Johnson protected an attempted rescue of another Wild Weasel crew that had been shot down, in the process destroying two MiG-17s. After running out of ammunition, Thorsness and Johnson continued to act as decoys to draw the MiGs away from the rescue aircraft. Nonetheless, the rescue eventually failed. The Thunderchief was rapidly withdrawn from USAF service after the end of the Vietnam War. Of the 833 F-105s built, nearly 50% were lost in Vietnam. By US military standards the F-105 was no longer considered combat-effective. Some aircraft remained in service in the 1970s and 1980s with Air Force Reserve and Air National Guard units, but their extended wartime service meant that many F-105s had already reached or exceeded their service lives by the mid-1970s. The F-105 Thunderchief was officially retired on 25 February 1984. The F-105, however, had a very good service life considering most of its fellow US made 2nd generation aircraft were also retired from service in the mid-1970s, a decade before the Thud retired. F-105F Two-seat trainer version of F-105D with lengthened forward fuselage, dual controls, taller fin, fully combat-capable, AN/APN-148 navigational radar replaced the AN/APN-131 radar in earlier models, first flight 11 June 1963; 143 built. EF-105F Initial designation for a Wild Weasel/SEAD version, 54 conversion from F-105Fs. F-105G Two-seat Wild Weasel/SEAD version with AN/APN-196 navigational radar replacing AN/APN-148 in earlier models, re-designation of the RF-105F conversions. Picture - A surviving F-105D Thunderchief at the National Museum of the United States Air Force. Hardpoints: 5 total: 4x� under-wing, 1x� centerline pylon stations plus an internal bomb bay with a capacity of Up to 14,000lb (6,400 kg) of ordnance, including conventional and nuclear bombs, and AIM-9 Sidewinder and AGM-12 Bullpup missiles. Hobson, Chris. Vietnam Air Losses, USAF, USN, USMC, Fixed-Wing Aircraft Losses in Southeast Asia 1961-1973. North Branch, Minnesota: Specialty Press, 2001. 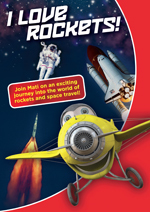 ISBN 1-85780-115-6. Toperczer, Istvan. MiG-17 and MiG-19 Units of the Vietnam War. London: Osprey Publishing, 2001. ISBN 1-84176-162-1.